When you swallow a pill -- either prescription medication, an over-the-counter type or a vitamin formulation -- it can sometimes feel as though it is stuck in your throat. While your throat is likely large enough to accommodate most pills, that sticky feeling can be uncomfortable. You can ensure that you swallow your pills easily every time by preparing your mouth properly and swallowing your pill in the right way. Take a sip of water before you even place the pill in your mouth, suggests the Health Key website. Drink a couple of gulps in order to wet your throat in preparation for the pill. Then, take another sip and hold the water in your mouth. Slip the pill in your mouth and allow the water to make the pill slicker. This should help it slide down your throat easily. Tuck your chin down to your chest and swallow. It may be second nature to tip your head back while swallowing, but tucking down will actually force the pill to the back of your throat for better efficiency. Swallow hard, ensuring that the liquid in your mouth goes with the pill. Read the labels and information that accompanies your medication. If you feel like you have the pill stuck in your throat despite your preparation, eat a piece of food that has a large volume yet is easy to swallow. This will help push the pill downward. Roll a soft piece of bread into a ball and eat it, but first make sure that your medication is compatible with food. Swallow a thick drink to help push the pill down if you still have a sticky sensation. A liquid thicker than water, like orange juice or a milkshake, can get rid of the unpleasant sensation once you've swallowed the pill. 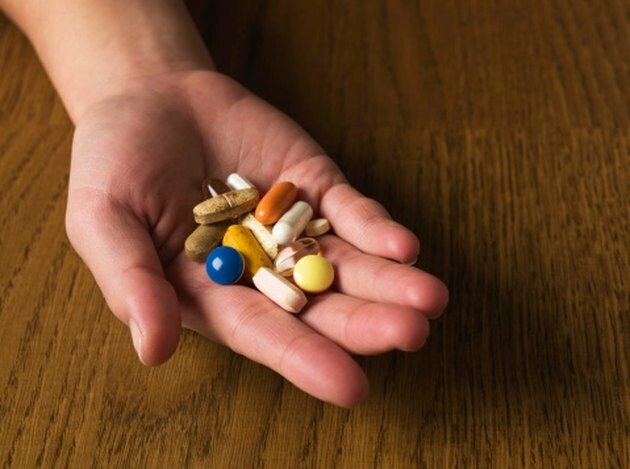 Talk to your doctor if you still have trouble swallowing pills, even with food or thick liquids. She may be able to prescribe a liquid version of the medication so you can still take your medicine correctly and effectively.